LONDON--(BUSINESS WIRE)--The global retinal vein occlusion treatment market 2019-2023 is expected to post a CAGR of more than 9% during the forecast period, according to the latest market research report by Technavio. A key factor driving the growth of the market is strong pipeline and recent drug approvals. The drug development process is a long and expensive process. Before entering the market, therapeutics undergo various clinical trials and then get approved by regulatory authorities such as the United States Food and Drug Association (US FDA) and the European Medicines Agency (EMA). Most of the therapeutics that are in last stage of development are expected to get marketing approval during the forecast period. This market research report on the global retinal vein occlusion treatment market 2019-2023 also provides an analysis of the most important trends expected to impact the market outlook during the forecast period. Technavio classifies an emerging trend as a major factor that has the potential to significantly impact the market and contribute to its growth or decline. Biosimilars are generic versions of biologics and are also known as reference products. Biosimilars are approved by the US FDA. The main advantage of biosimilars is that they are about 20% less expensive than biologics. Fewer clinical trials are needed to be performed for biosimilars compared with biologics, which is the main reason for their lesser cost. “The patent of some of the branded RVO drugs is expected to expire soon, which will increase the demand for biosimilars. For instance, Formycon is developing both Lucentis and EYLEA biosimilars. FYB201 is a biosimilar of Lucentile, which is currently in the Phase III stage of development. the shift toward the development of biosimilars is expected to fuel the growth of the global RVO treatment market during the forecast period,” says a senior analyst at Technavio for research on infectious and rare diseases. This market research report segments the global retinal vein occlusion treatment market by end-user (BRVO and CRVO) and geographical regions (APAC, EMEA, and the Americas). The Americas led the market in 2018 with a market share of more than 49%, followed by APAC and EMEA respectively. The region is expected to continue to dominate the market during the forecast period. 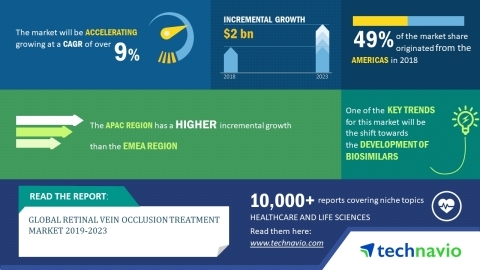 The global retinal vein occlusion treatment market 2019-2023 is expected to post a CAGR of over 9% during the forecast period, according to Technavio.